The Commissioner- General of the Guyana Revenue Authority (GRA), Godfrey Statia has highly confidential information about oil and gas companies, including ExxonMobil, under lock and key and will only release them if they are needed by officers for specific tasks. “The GRA is privy to such contractual arrangements. However in keeping with the law this information is confidential. To maintain its confidentiality and avoid leakages, the Commissioner-General will only share such excerpts of the said agreement with relevant officers in the event that their duties require them being privy to such information in the execution of such duties,” the GRA said in a statement. The GRA said it has taken that position because of, among other things, “the sensitivity and confidentiality of the document and the level of caution that had to be imposed as a result of persistent breaches of the Secrecy Oath at the Authority.”The recent Kaieteur News article “GRA officials ‘sailing’ on EXXON contract” is the latest such breach of confidentiality and further evidence of the need to exercise such diligence. That article included references to a recent meeting between GRA representatives and ExxonMobil at which the tax agency’s representatives did not have any baseline information with which to work in those talks. The tax agency issued the statement in response to a transparency and accountability campaign by the privately-owned Kaieteur News newspaper about Guyana’s oil and gas sector as the country prepares for first oil by 2020. The GRA said . 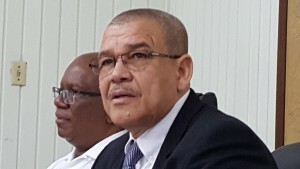 The GRA says it is preparing “rigid systems” to monitor oil and gas companies including ExxonMobil and that it remains committed to fulfilling its obligations as one of the regulatory bodies for the rapidly emerging oil and gas sector in Guyana. “Part of that commitment involves the imposition of rigid systems at the Authority to closely monitor exploration companies that are undertaking exploration and extraction of oil offshore, in keeping with the contractual agreement between the Guyana Government and such oil exploration companies including ExxonMobil,” the national tax agency said. The Ministry of Natural Resources has in the past said there would be specially calibrated meters to calculate the actual volume of oil being pumped every day. Those meters can be inspected by government representatives aboard the Floating Production and Storage Offloading (FPSO) vessel. ExxonMobil has said that Guyana would begin earning revenue from the time the first amount of oil is pumped in 2020 from the Liza Field located more than 100 miles offshore. Minister of Natural Resources, Raphael Trotman is on record as saying that 75 percent of the oil proceeds would go towards ExxonMobil’s recovery of its investment -cost oil- and the remaining 25 percent would be split in half between Guyana and that company as “profit oil”. Calls have been issued by Transparency Institute of Guyana Inc; the opposition People’s Progressive Party Civic (PPP) and the Working People’s Alliance, a party in the governing coalition, for the contract between ExxonMobil and Guyana to be made public. Government says a section of the Petroleum Act prohibits disclosure of such agreements.